How would you like to purchase the Google Pixel 2 XL for $300 (or 35%) off the MSRP price of $849? 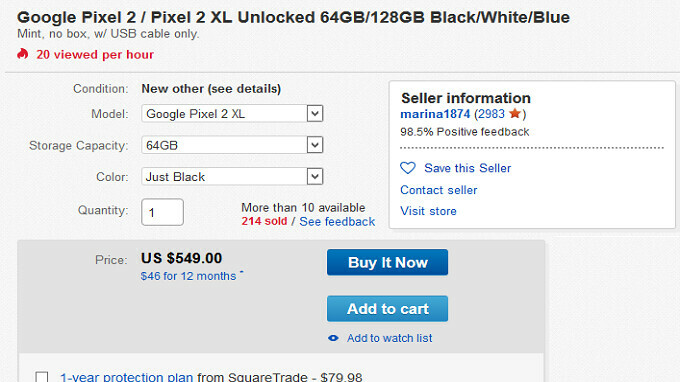 Right now, there is a seller on eBay with a 98.5% positive feedback rating who is offering a deal on select 64GB Pixel 2 and 64GB Pixel 2 XL models. And you can even agree to finance the payment over 12 months. The 64GB Pixel 2 XL in Just Black is yours for $549, or 12 monthly payments of $49.54 using a PayPal credit option (which adds interest taking your actual purchase price to $594.41). The 64GB Pixel 2, also in Just Black, is priced at $509. That is a $140 or 22% savings from the MSRP of $649. This model can also be financed over 12 months at $45.93/month (bringing the total with interest to $551.04). The price of both phones includes free shipping. The seller has already rung up a total of 214 units, and all we know is that he has more than 10 left to sell. While the phones are said to be in "mint condition," they do not ship with the box and come with a USB cable only. If interested in either deal for the Pixel 2 XL and Pixel 2, click on the sourcelink below. Garbage. Google needs to kill off the gay sounding name and go back to the Nexus branding. Takes a lot more than just a great camera to make a great device. These phones were voted the worst. My daughter needed a new phone and she insisted on getting a pixel despite my warnings...she now regrets that she didn't pay attention to what I was telling her. You seem to think you're important. Google doesn't care what you think. Great deal. I returned mine because of the high price. For $550 I ordered one.